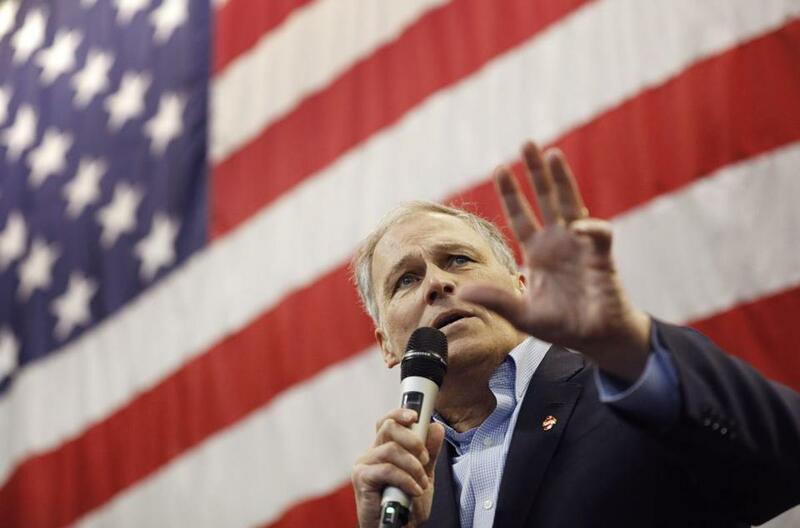 Washington Governor Jay Inslee spoke at the Battle Born Progress Progressive Summit last month in Las Vegas. LAS VEGAS — The rapidly growing 2020 presidential field is shaping up to be a Wild West of Democratic primaries — with the actual West emerging as a decisive battleground. The delegate-rich state of California has vaulted itself near the front of the primary calendar, which means candidates seeking to break away from the pack will be looking to build early support on the left coast. The action has already begun in Nevada, the third state to vote, which also hosted a parade of potential candidates during the midterms. “With California coming on early, I think the West is more important than ever,” Harry Reid, the former Nevada senator who helped boost his state’s clout in the party selection process, said in an interview. The West has a younger, more diverse population than the traditional early states of Iowa and New Hampshire, and they are expected to tilt the Democratic debate toward issues such as immigration and climate policy. The reworked primary calendar could also dissuade candidates from dropping anchor in Iowa or New Hampshire for long stretches, potentially raising Nevada’s stock among the quartet of early voting states that includes South Carolina. With its large and strong labor unions and diverse population — almost 30 percent Hispanic or Latino, nearly 10 percent black, and about 10 percent Asian or Pacific Islander — Nevada will give an early indication of a candidate’s ability to draw support from core Democratic voting groups. Nevada has become increasingly blue in recent years — and many in the state credit Reid, who built up the state party apparatus and helped strengthen Democratic-leaning political organizations. In 2016, Nevada voters picked Hillary Clinton over Trump. And in 2018, thanks in part to a massive get-out-the-vote operation powered by labor unions, Democrats picked off a US Senate seat and the governor’s mansion, and held three of the state’s four congressional seats. Those 2018 campaigns featured visits from Joe Biden, Bernie Sanders, Kamala Harris, and Cory Booker, whose mother lives in Las Vegas. 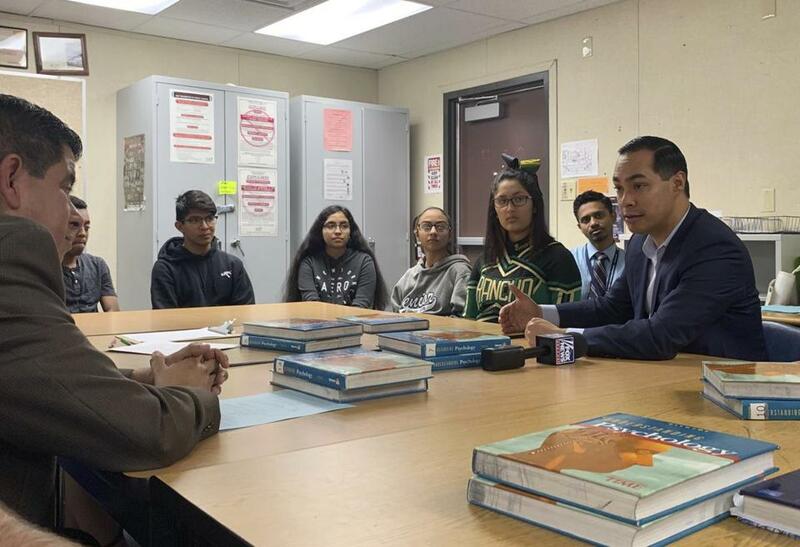 Former Housing and Urban Development secretary Julian Castro took part in a roundtable with Latino voters. Sherrod Brown, US senator from Ohio, is expected to bring his “Dignity of Work” tour to Nevada, while former Housing and Urban Development secretary Julian Castro has already taken part in a roundtable with Latino voters. Jay Inslee, the governor of Washington state who is weighing a 2020 bid, also visited Nevada in January. Warren has worked to strengthen her ties to Nevada, with numerous visits over the years, including for a hearing of her Congressional Oversight Panel on the economic bailout following the 2008 financial crisis. In 2016, she campaigned for Catherine Cortez Masto, who became the first woman from Nevada, and the first Latina, elected to the US Senate. And her presidential campaign staff includes Kristen Orthman, a former top aide to Reid. And Reid himself played an important role in Warren’s political rise, tapping her for the bailout oversight role in 2008, when she was a professor at Harvard. He encouraged her to run for the Senate in 2012, named her to a leadership position in 2014, and after the 2016 election of Donald Trump, reportedly told her to consider running for president. Nevada was a Democratic battleground in 2008, when Clinton beat Barack Obama, and again in 2016, when Clinton’s victory here buoyed her campaign after Sanders posted a decisive win in New Hampshire and also nearly won Iowa. It is not yet clear how the new voting calendar will affect the candidates’ schedules within the West. There has been some hand-wringing in Nevada political circles that candidates may skip the state and go straight to California, which could start early voting in early February. But California, with its huge population and sprawling media market, requires a television-focused campaign strategy, as opposed to the retail focus of the Nevada caucus and the other three early states. Supporters cheered California Senator Kamala Harris. The other factor giving the 2020 primaries a Western flavor is the candidates themselves. 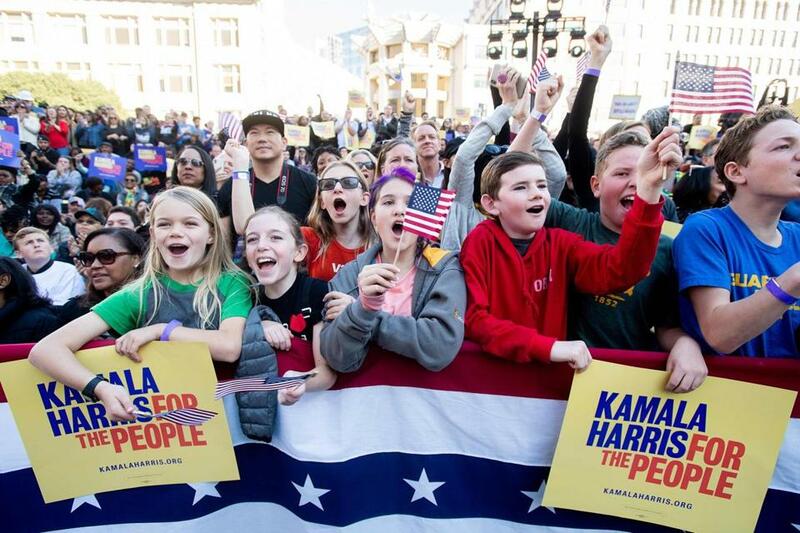 Harris, who was born in California and has lived there most of her life, drew a crowd of 20,000 to her campaign kickoff in Oakland last weekend. And waiting in the wings is a group of current and former Western governors — including Inslee, Steve Bullock of Montana, and John Hickenlooper of Colorado. Castro is from Texas, as is one of the party’s other rising stars: Beto O’Rourke, the former congressman and Senate candidate whose extended deliberations over a presidential bid have sparked wild speculation. Texas is set to vote the same day as California. Roberta Lange, the former head of the Nevada Democratic Party, has already received a call from Warren (“she’s really loved here,” Lange said), but then she hosted a “Draft Beto” party last weekend at her Las Vegas home. Intrigued by an O’Rourke candidacy, the roughly 15 attendees at Lange’s house were also excited about the role the West and its candidates could play in the primary. Their priorities, and those of other Nevada activists, suggest the path any Democrats must pursue to win their votes. Matthew Defalco, a former wildland firefighter who works on local political campaigns, said he hopes candidates will talk about climate change in a way that reflects the immediacy of the threat in the West. Eric Rodriguez of the advocacy organization UnidosUS said Nevada’s large bloc of Latino voters will be a potent influence. “You’re going to hear more candidates . . . talking about what’s on the minds of Latino voters when it comes to changes in immigration and reforms,” he said.